Practice management software (PMS) has become quite the buzzword among veterinarians seeking ways to improve and grow their practice. Such a software built on the cloud can be a lifesaver for multi- clinic chains and veterinary hospitals located across a city, region, state, country, or even the globe. Not only can users access it from multiple locations, but they can also obtain unified, real-time information from different clinics, irrespective of the time zones they belong to. Here are different ways in which a veterinary computer program helps manage a clinic chain effectively. Managing stocks of medicines, vaccines, tools, equipment, office supplies, dressing aids, pet food or other retail products is a task in itself. The staff in your clinic needs to monitor these stock levels from time to time to ensure that they are readily available when needed. They also need to dispose of expired products and procure fresh ones from vendors. In a multi-clinic format, while the inventory belongs to a respective clinic, a particular kind of product may be sourced from a single vendor. The inventory management tool that comes with a practice management software helps you create inventory lists and maintain stock levels for different clinics simultaneously. The inventory management tool in VETport’s PMS allows you to procure and inward inventory against specific purchase orders or without them so that you can receive items at a specific clinic and then re-distribute it to other clinics in the chain, if necessary. The specially designed ‘Basket Management System’ lets you link vendor items to stock plans. Such a tool also helps keep track of inventory items, transactions, expired items, and stock levels at each of the clinics in the chain. A clinic chain has needs different from that of a standalone private practice. A veterinary practice management software tackles many issues that arise from running veterinary businesses at multiple locations. However, there may be instances where you need a little fine-tuning. Task manager tools in PMS helps you create and assign tasks to the employees in your clinic. This helps in better work division while also allowing you to review the progress of different tasks from time to time. VETport’s thoughtful design helps users to prioritize different tasks and set deadlines while helping you to track the progress of each task in the Task Manager dashboard. Such a feature is extremely beneficial to veterinary hospital chains whose workforce consists of veterinarians and staff who oversee specific functions across different clinics. The tool lets them assign and accept tasks not just within the clinic that they work in, but also across others in the chain. Plus, there are notifications that are generated from time to time to help keep track of progress and completion. In addition to the task manager, VETport makes internal communication possible through clinic chat messengers, which function similar to instant messengers. The software also includes a bulletin board, which lets you or your staff display information or public messages. The chats simplify work-related communication and contain it within the system. The bulletin board serves as a useful tool when information received at a particular clinic needs to be broadcast to all subsidiary concerns in the chain. Managing clinics or hospitals functioning in different time zones is a different task altogether. Keeping track of tasks and calendar schedules in a different time zone can be tedious for a user. With this in mind, VETport offers the feature of multiple time zone compatibility. The clever design displays messages, alerts, and reminders as per your time zone or based on the location that is set into the software. 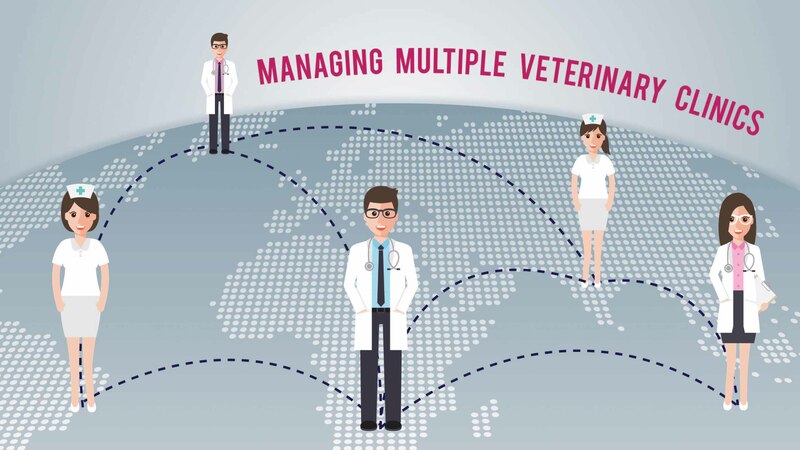 This means that even when veterinarians and staff function out of different locations, all their activities are displayed in the time zone that they function in. For example, a veterinarian who logs into the software from a clinic in Atlanta will be able to see tasks and activities in EST while a staff who logs into the same software from Seattle will see them in PDT. A multi-clinic chain may comprise different hospitals that cater to different specialties or they may include care centers that offer the same services across. However, not every clinic or hospital in the chain functions alike. It is common to see a well-paying procedure in one clinic have no takers at another clinic that is part of the chain but in a different location. Insights into top-paying procedures are extremely crucial to clinic chains, as it helps maintain the financial health of the business. Business analytics and reports in VETport provide you snapshots of the different procedures and the bills against them in each of the clinics. It also gives you a breakup of the procedures performed by the different vets in your team. Such information is helpful in hiring decisions, especially when you want to expand your practice at a particular location or across all clinics in the chain. Calendars, like task managers, are an extremely useful tool, which provides a bird’s eye view of events in your practice. VETport’s calendar scheduler is designed to automatically synchronize between multiple clinics, even when they belong to different time zones. It displays events in day, week, month, and timeline views, as per the viewer’s preference. This ensures that the latest, most relevant information is displayed to all users of the software, no matter where you are located. Additionally, the calendar allows color coding of events and lets you send automatic reminder emails or SM-es to clients, when necessary. A clinic chain has needs different from that of a standalone private practice. A veterinary practice management software tackles many issues that arise from running veterinary businesses at multiple locations. However, there may be instances where you need a little fine-tuning. In such instance, use customization features to modify the software to suit your needs.